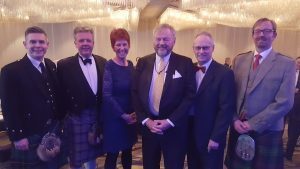 On January 25, 2019, ScotCanBC held our 2nd annual Burns Supper gala event at the Pan Pacific Hotel raising over $14,000 for Prostate Cancer Canada’s Plaid for Dad campaign. 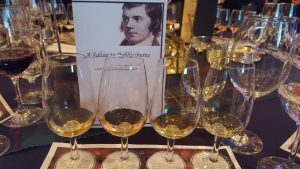 Over 100 guests attended this spectacular showcase of the Scottish food, drink and culture in honour of the bard himself. The event was supported by our partners and sponsors, including the British Canadian Business Association, Prostate Cancer Canada, Visit Scotland, British Airways, Helijet, MCL Motor Cars, Authentic Wine & Spirits, LNER, Indigo hotels and Tennent’s. 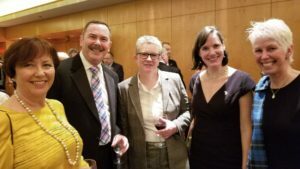 We were thrilled to have UK Consul General, Nicole Davison and Ireland Consul General, Frank Flood join us this year, in addition to many individual and corporate guests returning from last year. 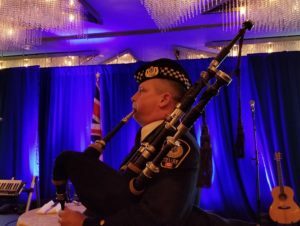 The night started with a reception with whisky tastings and some delicious appetizers, including wild boar haggis, kippers on toast and whisky cured Scottish salmon, prior to being piped into the ball room by a member of the Vancouver Pipe Band. Our MC, Fred Lee, then got the evening started. The Chairman’s address and the Selkirk Grace were made by ScotCanBC President, Gareth Withers, and a very spirited Address to the Haggis was given by fellow board member, Ross McDonald. This year’s dinner included Cullen skink, (a smoked Haddock and potato soup), a baked Macsween’s haggis and venison duo and well as the traditional neeps and tatties. 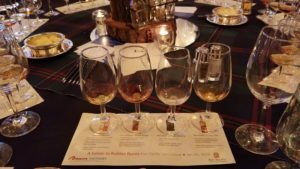 The accompanying Scottish whisky flights were provided by Authentic Wine and Spirits. The meal was artfully finished with a “Tipsy Laird” (trifle with fresh raspberries and cream). The live auction, led by Mark Mahl, raised over $14,000 for Prostate Cancer’s Plaid for Dad campaign; a very worthy cause. The energetic and supremely entertaining Mad Celts provided the post dinner entertainment and offered a vast array of music that seemed to cover every Scottish tradition. Of course, no Burns supper would be complete without the toasts, which proved to be one of the highlights of the evening. The Toast to the Lassies was delivered by ScotCanBC member Archie Campbell. The reply was given by ScotCanBC board member and Vancouver Park Board Commissioner, Tricia Barker. The night ended with the traditional singing of Auld Lang Syne as we all bid farewell until next year. We are already looking forward to the next one! We wanted to take this opportunity to wish you all a happy St. Andrew’s Day! We got our celebrations off to an early start with our event on November 22nd at the Whisky Room at The Devil’s Elbow in downtown Vancouver. ScotCanBC partnered with ICAS (The Institute of Chartered Accountants of Scotland) to host an event for members of our respective organizations, as well as other like-minded non-member business professionals. Nicole Davison, our local UK Consul-General, was on hand to talk about the UK trade and investment landscape, as well as the latest on Brexit. It was great to renew old acquaintances and to welcome some new friends. This was a great opportunity to reconnect with ScotCanBC and ICAS members, as well as growing your personal network. If that wasn’t enough, it was also the perfect excuse to celebrate St. Andrew’s Day a week early. Our thanks to everyone who joined us and made this one to remember. 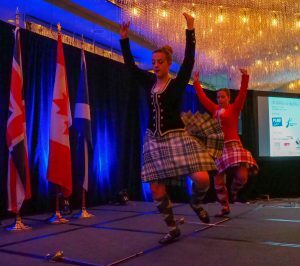 On January 25, 2018, The Scottish-Canadian Business Association of BC (“ScotCanBC”) teamed up with the Pan Pacific Hotel and the British Canadian Business Association to host our first annual Rabbie Burns Supper. The event was a huge success with over $12,000 raised for the Prostate Cancer’s Plaid for Dad campaign. Around 100 guests enjoyed a reception and dinner that included MacSween’s haggis imported directly from Scotland by our friends at Fresh Concept Canada. 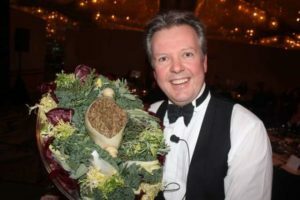 The occasion marked one of the first Burns Suppers in almost 50 years to serve Scottish haggis, following the lifting of the import ban in Canada. The menu also featured venison, smoked salmon and other culinary delights from the world-class Pan Pacific team. 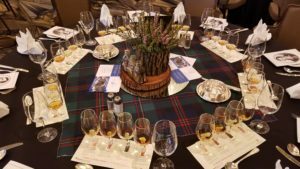 Guests were also able to celebrate the bard’s birthday with Scottish whisky tastings from Compass Box, Benromach, Glenglassaugh and Glendronach. 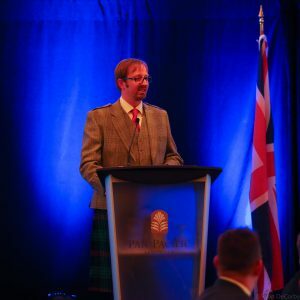 Gareth Withers, ScotCanBC – President, gave the welcoming speech and, Ross McDonald, ScotCanBC – Board Director, gave the addressed the haggis with gusto. 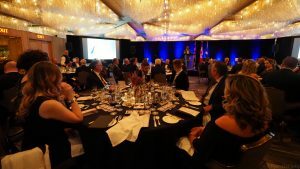 Following dinner, a live auction was held with auction prizes including a business-class trip to Scotland, Heli-Jet tickets for the Vancouver fireworks, rugby tickets and a bottle of whisky. Between the live auction, donations from the ticket price and donations received on the night, we are proud to say that over $12,000 was raised for Prostate Cancer Canada’s Plaid for Dad campaign. Thanks to sponsors British Airways, Helijet, Rugby Canada, Apex Hotels, Virgin and Authentic Wines and Spirits for their donation of the prizes. Stephen Peters, Pan Pacific – General Manager, gave the Toast to the Lassies and the spirited Reply to the Lassies was given by Kerris Hougardy, British Canadian Business Association – President. Shot Of Scotch Highland Dancers were there to add in the entertainment. Great thanks to Fred Lee for MCing the event. And here’s some of our ScotCanBC Board Members all enjoying what we expect to be an annual event! Slàinte mhath from all of us at ScotCanBC! On September 18, 2014, the people of Scotland will vote in an historic referendum. They will be asked the question: Should Scotland be an independent country? This is a significant event for Scots all over the world, including those of us with Scottish connections and heritage living in Canada. ScotCanBC (the Scottish Canadian Business Association of BC) would like to invite you to a very special Scottish Independence Debate moderated by Iain Black, President and CEO of the Vancouver Board of Trade. The debate will take place at Simon Fraser University’s Harbour Centre on Thursday, September 11th, 2014 from 5:30pm-7:45pm. Tickets for members are free (annual membership is $50) and tickets for non-members are $25. Tickets can be purchased here. Non-members who purchase a ticket will also have the opportunity to sign up for membership on the night for $25. You can renew your membership or become a member by completing and returning the form located here. Four prominent Scottish Canadian figures from Vancouver’s business community will debate their reasons for answering either ‘Yes’ or ‘No’ to the referendum question. Alma Lee, Founder of the Vancouver International Writers and Readers Festival. Gareth Brown, Director of Canadian Operations for Sgurr Energy, a Scottish renewable energy consultancy. David Lunny, Founding Partner of Lunny Atmore LLP and former President of the St. Andrew’s and Caledonian Society of Vancouver. Euan Sinclair, Director of Knowledge Management for Lawson Lundell LLP. We hope to see you at what promises to be a lively debate. VANCOUVER, British Columbia (April 3, 2014)— Scotland’s Minister for External Affairs and International Development will host a special Scotland Week event with ScotCanBC (the Scottish Canadian Business Association of British Columbia), supported by Scottish Development International, on Friday, April 4 2014, in Vancouver. Humza Yousaf MSP, Scotland’s first Muslim minister, will talk about strengthening business ties between Scotland and Canada to business leaders from across British Columbia and members of ScotCanBC, a volunteer led, not-for-profit organization that seeks to expand trade and investment between Scotland and British Columbia. His visit coincides with Scotland Week, which is an annual celebration of North America’s Scottish heritage. It also marks the only visit to Canada by a Scottish Government Minister before Scotland’s Independence Referendum on September 18 2014. “Scotland’s relationship with Canada is very important to us, and we are committed to strengthen that friendship in the years ahead,” said Yousaf about his visit to Vancouver. “I want to use this visit to Canada to build on our strong cultural and historical links, and to explore opportunities for investment and trade, and exchange of skills and expertise”. Census data highlights that 20% of people living in British Columbia and 15% of all Canadians claim Scottish descent. This makes the Scottish community the third largest ethnic group in Canada. There are over 30 Scottish companies operating in Canada with many more doing business with Canadian partners. In 2012, British Columbian exports to the UK were worth $328 million. Opportunities for increased trade span multiple industries including forestry, energy, food and drink, technology, life sciences and tourism. ScotCanBC was founded in June 2013, and is a volunteer led, not-for-profit organization that seeks to expand trade and investment between Scotland and British Columbia, Canada. For more information about membership and sponsorship opportunities please visit www.scotcanbc.org or email wecan@scotcanbc.org. SDI is a joint venture between the Scottish government, Scottish Enterprise and Highlands and Islands Enterprise which helps overseas businesses tap into Scotland’s key strengths in knowledge, high level skills, technology and innovation. SDI also works to help Scottish companies do more business overseas and to promote Scotland as a good place to live and work. Its work is guided by the Scottish Government’s strategy for economic development in Scotland. SDI established its operations in Canada in February 2011 with the opening of a Toronto office and opened an office in Calgary a year later. For more information about SDI, contact: Scottish Development International, 777 Bay Street, Suite 2800, Toronto, Ontario M5G 2G2 Canada. Telephone: 416-408-4334 or visit www.sdi.co.uk. ScotCanBC, in partnership with Scottish Development International, is pleased to announce that Humza Yousaf, Scotland’s Minister for External Affairs and International Development, will visit Vancouver for the first time in early April. Together we will host a special Scotland Week event at the Terminal City Club on Friday, April 4th. All members have received their email invitation and are asked to RSVP by Friday, March 21st, to: Silvia.Gulyas@scotent.co.uk. New members are welcome and encouraged to sign up for ScotCanBC membership ASAP to ensure their place at this event. ScotCanBC would like to invite members to an informal evening of drinks and appetizers with Scottish Development International (SDI) Canada’s Senior Vice President, Raymond McGovern, on Thursday, February 27th, from 6pm-8pm at Craft Beer Market in the Olympic Village, Vancouver. Raymond will preview an exciting ScotCanBC/SDI event that will see Scotland’s Minister for External Affairs, Humza Yousaf, visit Vancouver for the first time on April 3rd (all members will receive an invitation in early March). This informal ‘mixer’ will also allow ScotCanBC and SDI to update members on our recent progress, activities and plans for the year. It’s also a chance for you to ask questions and contribute to the ongoing development of the group – and to the planning of the Scotland Week event in April. Please confirm if you would like to attend this social mixer and preview by the morning of Wednesday, February 26th, as reservations are required to accommodate a large group. Confirm by email to WeCan@ScotCanBC.org. What links the world’s top school for entrepreneurship (Boston’s Babson College), global professional services firm Deloitte, prominent UK entrepreneurs, employees and students of all ages and some of the world’s poorest people? The answer is the Micro-Tyco Business Challenge, created by Mick Jackson, founder of WildHearts in Action Ltd.
Mick Jackson, with support from ScotCanBC, is in Vancouver to talk to organizations about the program on July 26 and we invite you to come along to learn more about how your organization, employees and students can benefit from taking part in the next (and Canada’s first) Micro-Tyco Business Challenge scheduled for November 2013. Micro-Tyco has been described by some of the UK’s top business minds as the ‘ultimate enterprise training’. The Scottish Government would like Micro-Tyco in every school in Scotland. Teams of employees or students are given a seed loan of $1 and have 4 weeks to grow it (by any creative and legal means possible) into as much money as possible. For example, one Scottish school team purchased slightly overripe fruit, which they sold to make 20 times their initial seed loan and then continued to grow their capital to $14,000 through a range of different commercially focused activities. Profits from the project are then provided to some of the world’s poorest people to work their own way out of poverty with dignity and self-respect. No additional donations or payments are required. Micro-Tyco brought together over 1100 teams from schools, colleges, universities and business to generate profits of nearly £250,000 in 2012. In February 2013 profits equaled almost $350,000. The Micro-Tyco challenge enables employees and students to flex their entrepreneurial muscles, stretch their imaginations and learn team-working skills that will benefit their organization, career and studies. Participants will become dynamic wealth creators and global ethical investors. Micro-Tyco’s ethos is that once you release your talents the whole world benefits. Mick Jackson is coming to Vancouver from July 26-29 to meet organizations that would like to learn more about participating in this unique program. ScotCanBC is hosting a ‘Lunch and Learn’ presentation and Q&A at RBC Dominion Securities HQ in Vancouver (Suite 2500, 666 Burrard Street) on Friday, July 26 from 12-2pm. Mick is also available for one-to-one meetings by request. Please contact WeCan@ScotCanBC.org if you would like to attend. WildHearts in Action is an international organization based in Scotland that launches companies and uses their profits to tackle poverty in the developing world. Founder, Mick Jackson, is a serial entrepreneur and recipient of the prestigious ‘Top Scot’ award, an honour he shares with author JK Rowling. VANCOUVER, British Columbia (June 6, 2013)—Today marks the launch of British Columbia’s first Scottish Canadian Business Association: ScotCanBC. ScotCanBC is a volunteer led, not-for-profit organization that supports the expansion of trade and investment between Scotland and British Columbia. Scotland and Canada’s close ties inspired ScotCanBC’s creation. Census data highlights that 20% of people living in British Columbia and 15% of all Canadians claim Scottish descent – the third largest ethnic group in Canada. In 2011, Scottish exports to Canada were £320 million (approximately $500 million). There are over 30 Scottish companies operating in Canada with many more doing business with Canadian partners. In 2012, British Columbia exports to the UK were $328 million. Opportunities for increased trade span multiple industries including forestry, energy, food and drink, technology, life sciences and tourism. The official launch of ScotCanBC takes place at an event tonight, which will feature a keynote speech from Dr. Lena Wilson, CEO of Scottish Enterprise, and include over 70 guests from BC’s Scottish Canadian business community. ScotCanBC is a volunteer led, not-for-profit organization that seeks to expand trade and investment between Scotland and British Columbia, Canada. 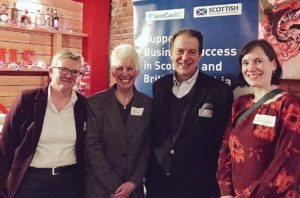 ScotCanBC will host four events a year to share knowledge about commercial opportunities in Scotland and BC; to connect people, companies and government agencies; and to showcase companies that have benefited from trade and investment support. Membership and sponsorship opportunities are available. For more information about ScotCanBC please visit www.scotcanbc.org or email wecan@scotcanbc.org.